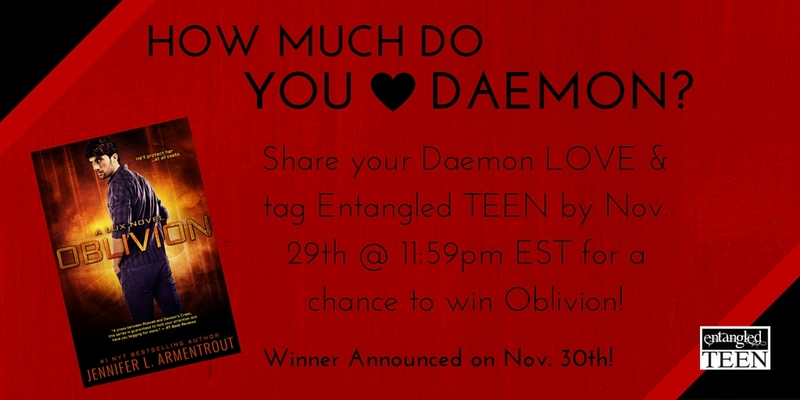 You Are Here: Home » Around the Web » Tell Us How Much You Love Daemon to Win Oblivion! If you’re a fan of Jennifer L. Armentrout and the Lux Series, then you know that Oblivion, a book entirely from Daemon Black’s POV, is coming out on Tuesday, December 1st. Obviously, you’ll be dying to read this book – that’s just a given. If – for some unknown reason – you haven’t pre-ordered your copy yet and you live in the U.S., then now is your chance to win 1 of 2 copies from Entangled TEEN! But how? Basically, we want to find how much of a Daemon Black fan you are, and there are a bunch of ways to do that, like sharing your fave scene from the Lux Series or the reasons that you love Daemon on social media.